Mixed Blood Theatre strikes again. Daring and resourceful founding Artistic Director Jack Reuler, holding cutting edge as the company’s calling card, stages David Valdes Greenwood’s Mermaid Hour: Remixed. Adapted from Greenwood’s acclaimed drama, this musical is the saga of Vi, a flowering Latina and Asian lass coming to terms with herself as a young mixed-race transgender person. As if adolescence alone isn’t enough of a challenge. Reuler discovered the script at a reading showcased by National New Play Network. “We’ve been trying to become more of a home for trans theatre artists the last four [to] five years — trying to be a destination for mixed race theatre,” he said “The composer Eric Mayson, the director [Leah Anderson] and the characters were bi-racial. Ironically, for all Minneapolis pats itself on the back for celebrating multiculturalism, particularly when it comes to matters of non-heterosexuality, there’s a dearth of theatre reflecting that sensibility. “The first thing we did was in 1986 when Don Cheadle was in Liquid Skin, about someone transitioning and the reactions of everyone around them,” continued Reuler. “Then, we did Colossal about four years ago and we had a transgender director [Will Davis] who said there’s really a void in American theatre, not just the Twin Cities. Then, we did Hir by Taylor Mac, Then, for Charm, seven of the nine characters were not only trans but were played by trans actors. As well, at the end of The Mermaid Hour Remixed’s run, there’s ON OUR OWN TERMS: Voices at the Intersection of Transgender Experience and Mixed Blood Theatre, April 27-29, a series featuring two performances of the show along with performances of MJ Kaufman’s Sensitive Guys, and a reading of Ben Fisher’s No Bull. “It’s a natural extension of our vision that we were remiss not including earlier,” said Reuler. Azoralla Arroyo Caballero portrays 17-year-old Vi. Her reputation preceded her casting. Where actors customarily see a notice and show up looking for their next job, Reuler sent out feelers among his contacts to fill the role. All roads led him to one name: “Azzi,” as the trans youngster. Valdes Greenwood’s work has been staged across America, including Huntington Theatre Company, Ensemble Studio Theatre, Portland Stage, New York Theatre Workshop, Actors Theatre of Charlotte and the Humana Festival. Needless to say, his artistic credentials are in order. He added, “I’m also a gay, Cuban American raising a daughter of color, so I knew that I wanted to write a play as diverse as the American I live in. The play’s characters are ethnically diverse, as well as gay, straight, cisgender, transgender, and non-binary. 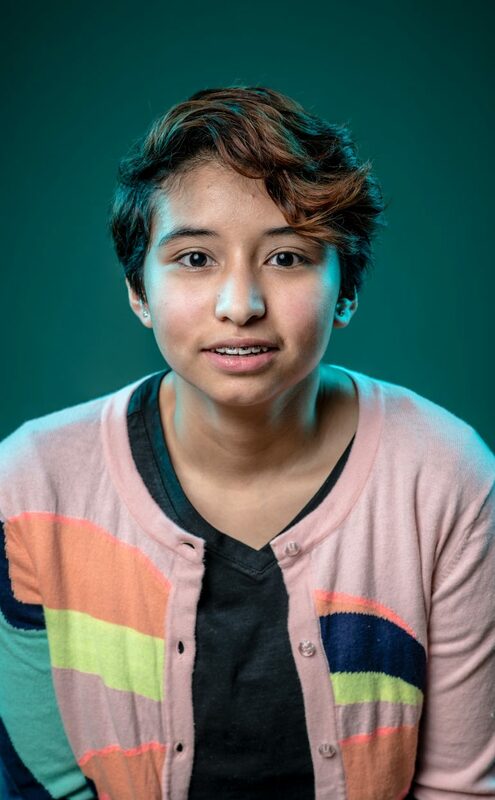 Valdes Greenwood reflected on the original script, “I started writing this play after hearing the stories of an old friend who was raised in a time when trans youth had few outlets for self-expression and their families had no resources to help them. Even today, when trans visibility has increased and more possibilities exist, the most loving parents can still find this journey complicated, confusing, and painful. Hence, once more Mixed Blood delves into thought-provoking territory, and does so with a carefully respectful eye on authenticity. David Valdes Greenwood’s Mermaid Hour: Remixed runs April 6- 29 at Mixed Blood Theatre, 1501 S. 4th St. on the West Bank in Minneapolis. Tickets can be obtained in two ways: 1) Through Radical Hospitality, admission is FREE on a first come, first served basis starting two hours before every show, or 2) Advanced reservations are available online or by phone for $25 per person. Visit www.mixedblood.com or call 612-338-6131 for more information.